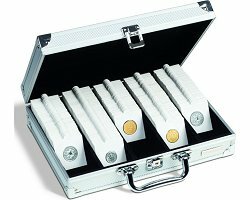 Coin case with 5 rows to store up to 650 coin holders or 150 QUADRUM coin capsules. Incl. 5 stoppers, allowing you to fix partially filled rows in place (so that the coin holders do not tip up). Fully lined in black velour. Lockable (two keys). Sturdy frame, reinforced with corner fittings made of aluminium. Practical, elegant handle. This case is ideal for transporting your collection. Overall size: 292 x 74 x 238 mm (11 1/2 x 3 x 9 3/8").